Venmo, MobilePay, Cookies, kwitt, N26’s MoneyBeam, PayPal, Wavy, Lendstar…and now Cringle. All of these services, apps, and companies have in common that they are used for P2P payments. Some of them failed, some of them are very successful, some will be and some won’t. Cringle, the Berlin-based startup, believes that it can be successful and has thus started their second crowdfunding campaign on Companisto (link to campaign). Besides P2P payments, Cringle also wants to offer a B2B payment solution allowing retailers and online shops to accept payments through Cringle. 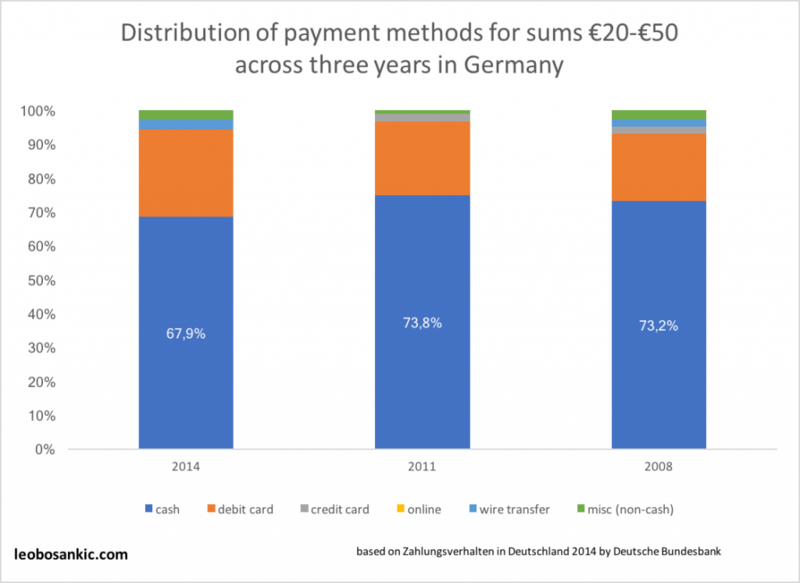 I won’t go into their B2B offering, but it merits to say that the German online payment market is dominated by PayPal, bills, debit and credit cards, and that the mobile payment space is yet to be dominated. Here I will look on their P2P payment solution. From a fundamental point of view Cringle’s success depends on process innovation. Process innovation can be defined along the following lines: „Process innovation means the implementation of a new or significantly improved production or delivery method (including significant changes in techniques, equipment and/or software)“ . And Cringle is exactly that. They take the old process of exchanging money between individuals and improve it by offering a platform for exchanging money cashless and quickly. With Cringle, there are two old processes. Exchanging cash and online transactions. The other part that will determine Cringle’s success is whether their solution is better than existing ones. Compared to online transactions, „cringling“ is better (Cringle wants to establish the word „to cringle“ synonymous for paying with Cringle. Side note: Terrible idea due to the similarities to „cringey“ and „cringe“). Compared to exchanging cash, however, „cringling“ is only the better solution if you prefer digital transactions over cash. Germans don’t. 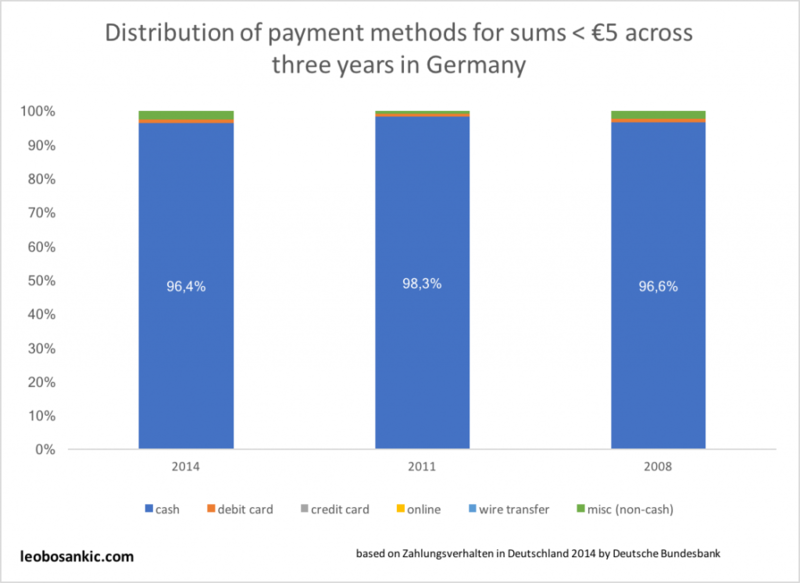 In 2014 Germans paid around 50% of all transactions in cash and the transactions were mostly lower than €50. For instance, up to 90% of all transactions lower than €20 (around the sum you owe somebody and thus would “cringle”) were paid in cash . This means that if you lend somebody money, you lend cash and because you need cash, you want cash back. Diffusion theory teaches us that one of the biggest influencers of product adoption is compatibility to what we are used. 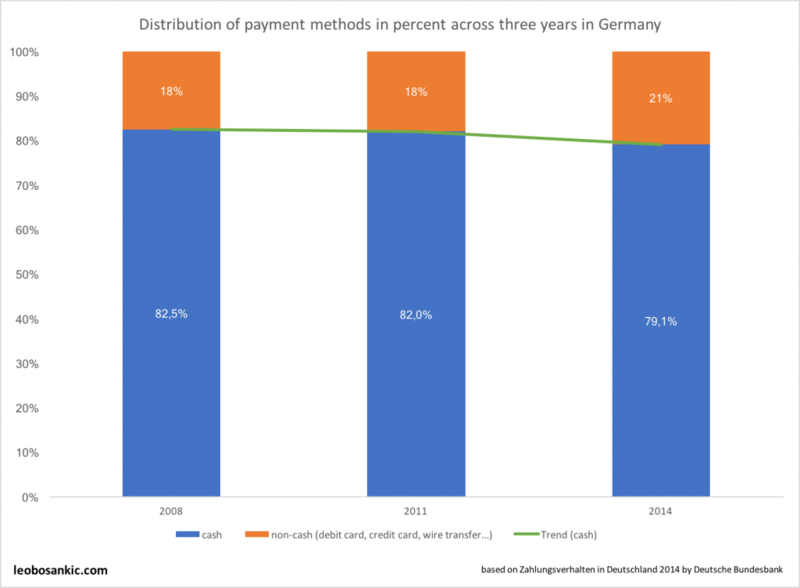 P2P payments — digital transactions — are not compatible with how money is handled in Germany, thus, no product adoption. Consider in contrast to this the situation with MobilePay in Denmark. MobilePay, a P2P payment app by Danish Danske Bank, has reached 3,4 million Danes (out of a population of around six million people) since its start in 2013 . One could argue that this is due to Danske Bank’ enormous 2,7 million Danish customers , but that would not explain the 70% of users who are non-Danske Bank customers . Rather, this is due to Denmark’s cash-less society, where now only one-quarter of all Danish people pay in cash . Thus, to establish a successful P2P platform, the best strategy is to start with a small niche where P2P in the form of „process innovation“ would be inherently useful. Lendstar, the four-year-old Cringle competitor with some 120.000 users, takes such a niche approach (although not 100%) with their “group and event“ targeting. For instance, they are targeting people sharing flats, people going on holidays or people who are collecting money for a present. Not only do all these examples have in common that exchanging money digitally rather than in cash makes them more convenient, but also that it is far easier to build a network around them. Convincing people who know each other to sign up for an app that would make their lives easier now, is easier than convincing unrelated people who might need your app in the future. This is the case with Cringle who is going to expand into other European countries besides Germany and Austria where they currently compete. And this is something I think Cringle got wrong, because — as indicated above — the problem with such a broad expansion is that it is difficult to acquire enough people to reach the threshold where network effects kick in an make your app useful. 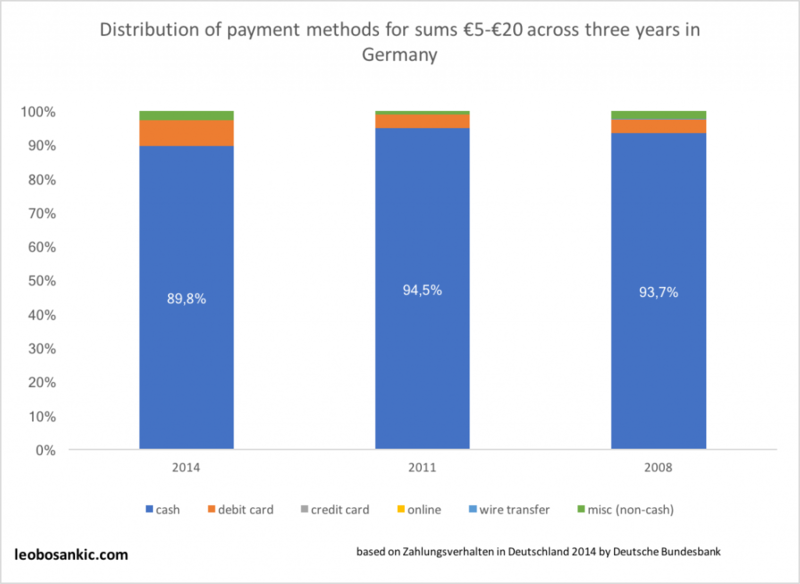 Besides such niches, however, P2P payments will become interesting for everybody in Germany because cash is slowly (very slowly) losing in importance. Nevertheless, that will not necessarily make life easier for Cringle because having a customer base is important. Germany’s cash-based society will change. In fact, since 2008 cash-less payments have been growing while cash-based ones have been declining since 2008 (admittedly very slowly). Whereas in 2008, 83% of all payments where cash, that figure declined to 80% in 2014 (as said, very slowly). Based on this, it is fair to assume that this shift towards cash-less will also be visible in P2P transactions. Note, however, that the change towards P2P will be gradual. Firstly, we will see a shift towards cash-less payments at retail stores. Based on that, people will start transferring money digitally between each other (because they carry less cash with them, because they are getting used to transacting cashless…) via online transfers (because P2P payment tools won’t be yet well known).Then, once we realize that transferring money online is cumbersome, we will start shifting from online transactions to digital P2P payments. And until this shift is „completed“ (completed in quotation marks as the shift won’t be clear-cut), Cringle will have a hard time because, by taking these two payments shifts at once (from cashless C2B to cashless P2P), they are too innovative or, in other words, providing a solution to a (yet) non-existing problem. Furthermore, if you consider how deeply ingrained cash is in Germany’s society, one could even argue that P2P payments depict a social shift as fundamental as the changing role cars in our society. As — compared to other consumer-facing industries such as social networks — customer acquisition can be very slow in the financial sectors  the most important differentiator is the customer base. Once you have your customers, you can relatively easy convince those to use a newly added service. Furthermore, if your existing service is a platform, adding P2P payments to it will make it inherently useful because there are already other people using it. Incumbents — who are not as bad as the startup world often argues — provide two great examples for the power of customer base. The above-mentioned MobilePay (3,4 million Danes out of a population of around six million people) is one example. Kwitt is another. Kwitt, deployed by the Sparkassen, did not roll out Kwitt as a standalone app as they did with their struggling paydirekt but included it in their core banking app. If you are already a Sparkassen customer, it is very likely that you already have their app and thus you are almost immediately (you must register for Kwitt within the app) a Kwitt-user. Furthermore, due to the 40 Million Sparkassen debit card users, they have a huge network on their platform out of the box. And it seems to work. Within three months 310.000 users registered for Kwitt and more than 500.000 transactions were made . It goes without saying that 310.000 users are low relative to the 40 Million customers, but compared to startups it is not so low after all. Lendstar, founded in 2013, has around 120.000 app downloads  and Cringle has acquired 75.000+ users since 2014 and it seems that they haven’t had more than 12.000 transactions in one month  (see table below user numbers of selected P2P apps). Another thing worth noticing about Kwitt is that by being integrated into the core banking app, it is not so much an app as it is a feature. Lendstar is similar and provides another interesting case for P2P payments’ uncertain industry and the discussion around feature vs. product. Although Lendstar describes its app as an “app for sending and receiving money” it does more than that. For instance, you can use it to top up your prepaid phone card, pay online shop bills, borrow money from friends (super exciting) or buy Amazon Gift Cards. This is crucial when considering that P2P payments can easily bee integrated into other applications such as Siri and thus it becomes irrelevant to the end users which app does the transaction. What this implies is that P2P payments are a use case too small to merit an own app and are thus a feature and not an app. As a consequence, P2P payment apps will be combined either through integration into other apps (e. g. Kwitt) or by building new functions based on the initial P2P app. As I have argued here, I think it is still unclear how deep up and down the value chain the „banking app of the future“ should be. The same applies to P2P payments. What should be integrated into the P2P payment app of the future? For instance, Lendstar is building „social banking“ around its P2P function, and MobilePay has evolved far beyond P2P payments into, amongst others, an online payment and a mobile payment solution. On the other side, if P2P payment apps become integrated as a feature into other apps, the question is which industry will dominate P2P payments. Will it be smartphone operating systems, banking apps (if such things will exist in the future) or a messaging app like WhatsApp? One interesting way to look at banking is through organizing banking around activities, rather than money when considering how more and more companies are pulling banking-related activities into their offering. For instance, in Q1/2016 21% of all U.S. based Starbuck transactions were paid through Starbuck’s mobile app. Uber is issuing credit cards and Lendstar wants you to do all your people-related banking activities in their app. Instead of using one app (your core banking app) for all your money-related transactions (paying for coffee, borrowing or sending money), you would have banking wherever you need it. Lendstar’s „social banking“ is one example. Instead of going into your banking app to pay your friend, you would do it from within the app. volders, the Berlin-based contract management startup could be another one. Instead of going into your banking app to pay for a contract, you would do it from within your app. Consider how Verivox, a comparison website, has acquired Aboalarm a startup for contract termination and Outbank a multi-banking tool. Although there hasn’t been any information that these tools might be integrated, I think it is another legitimate example to consider in the context of activities-based banking. It might depend on the subsector, but, for instance, some of Germany’s biggest direct banks still have around 10% market share. comdirect which was founded in 1994 is one such example.